Looking for Christmas ideas that are red, white, affordable and eco-friendly? Look no further. Just in time for holiday entertaining and gift-giving season, Bialetti offers its must-have Aeternum line of pots and pans made with an innovative white, nanoceramic non-stick coating. The unique white coating provides an extraordinary cooking experience and provides a healthier, greener way to cook because its PFOA free. The highly advanced and easy to clean nanoceramic coating paired with an extra-thick aluminum body makes Aeternum by Bialetti a dream to cook with. Aeternum by Bialetti is available in a red scratch resistant exterior finish and includes an 8”, 10” and 12” sauté pan with glass lid, a 2-quart saucepan with glass lid and a 12” deep sauté pan with glass lid. Cooking enthusiasts will enjoy the added environmental sustainability benefits of Aeternum. 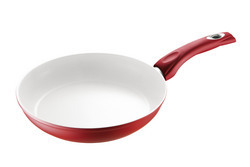 In addition to being PFOA free, Aeternum has its nonstick coating applied at a low temperature, leading to a lower emission of C02 into the atmosphere. The ceramic surface also provides excellent thermal properties and even heat distribution, so dishes are cooked to perfection every time. The amazing new line of Aeternum by Bialetti cookware is currently available at Bialettishop.com and Amazon.com with a suggested retail price of $19.99 - $69.99. For more information on Bialetti USA, please visit our Facebook page: http://www.facebook.com/bialettiusa. Bradshaw International, headquartered in Rancho Cucamonga, Calif., is a leading marketer of kitchenware products and is the distributor for Bialetti USA.